HSETI1 PCB: An 89C2051 CPU, 8 driver ouputs (e.g. LEDs, relays), a speaker output, a light sensor input, 3 extra inputs, optional serial port, small simple PCB. 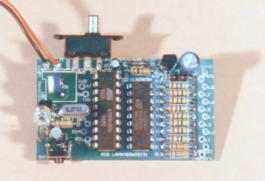 The PCB art, overlay, is pictured above. This image is a .GIF file saved at 300dpi. Most browsers can be instructed to download and save this image quite easily - for instance with Netscape, you right click on the image, then choose "save image as...". As the image is saved at 300dpi, a standard resolution of laser printers, you can print it out directly onto transparent film for making your own PCBs, and the scale will be substantially correct. The PCB art, top layer, is pictured above. The top layer diagram is used for the tracks that go on the component side of the circuit board. The PCB art, bottom layer, is pictured above. The bottom layer diagram is used for the tracks that go on the solder side of the circuit board. The layer is printed as if you are viewing through the circuit board (this is a convention used so that the layers line up) and will have to be reversed left-for-right before the copper tracks are printed. The PCB art, hole drilling diagram, can be obtained through the above link. The hole diagram is also saved as 300 dpi, but is usually not used to make a to-scale diagram. The PCB art, in protel CAD format, can be obtained through the above link. Phototransistor - many substitutes will work, but darlington types offer the best sensitivity. We have used BP103B (Farnell 212-763 in Australia). Flat goes toward TR2 for two leaded devices. Frequency depends on application program. Use a crystal, rather than a ceramic resonator (otherwise fit extra capacitors to gnd on X1 and X2). The program needed for the HSETI PCB will depend on what you want to do with the board. We have written a small skeleton program in 8051 assembler, the link for this is provided above. Also the assembler is available for download, the assembler is shareware, continued use will require registration. The program HSETI.ASM, above, contains equates for the I/O and exercises all the port bits. Running it should allow you to quickly test your new HSETI board. For more information on these microprocessors, visit Atmel's site. The diagram above shows a typical circuit using the HSETI PCB, with the optional serial port in place also. The serial port does not have strict RS232 level signals, but will work with just about all PC clones with reasonable cable lengths. The "component" X1 is just a link. To get better RS232 levels, cut X1 and insert a negative 3-4.5v power supply. This will give a +3/-3v RS232 Tx signal, which is better at driving longer cables than the +3v/0v signal obtained with X1 as a link. As noted previously, while this diagram shows 3v/4.5v battery, for best results, use 4.5-5v, or omit ULN2803A. This design is provided available for whoever wants it. There is no guarantee attached to it, naturally, although you can be assured that we have built the board as described, and run the test program on it. The original use for the board was for a kids group project here in NSW, Australia - making a "UFO" with flashing lights!